All cars are required to have an OBD2 port by law. Tesla vehicles have OBD2 ports for compliance, but, without an engine, most OBD2 codes are not applicable. There is data in CAN bus. Trying to get repair information from Tesla is difficult as they are not supportive of DIY repair. There is a “right to repair” law in Massachusetts although obtaining repair information is still difficult despite the laws in place in that state and fight to open up access. There is a website to purchase access if you live in Massachusetts or internationally, but reports have been mixed on actually receiving access. Here is the service page link: https://service.teslamotors.com/. The Tesla customer service representatives contacted by your editorial staff were not familiar with the service website and could not provide guidance. The connector on Model S is above the left foot rest below the steering wheel. These codes are from the original Tesla Roadster model but should be mostly applicable to other models. The below list consists of the code, fault message that appears, a debug mode message that does not usually display, and some notes on repair. To enter debug mode, tap the visual display six times and enter your access code. 3 blue Maintenance Service Required Have the car serviced or reset the service interval. 25 Blue Memory Stick transfer in progress. … Memory stick transfer in progress. Please do not remove. Car is downloading logs to USB memory stick. Data field shows completion percentage in hexadecimal. 27 Memory stick transfer failure. Reinsert stick to try again. 95 Park failed to disengage. Service required. 271 Battery Problem Vehicle shutting down BSM: Contractor power failure Has happened when starting car too soon after service plug has been inserted. Fix: Pull/insert it again and wait a few minutes before starting car. 409 TPMS: Hardware Error Tire pressure cannot be monitored reliably, e.g. if you just swapped your wheels. For a while, TM was selling a “TPMS Reset Tool” which seems to be no longer available (April 2014). 527 Yellow Right Headlight Bulb Out Check right front high beam bulb Replace the right high beam headlight bulb. 528 Yellow Left Headlight Bulb Out Check left front high beam bulb Replace the left high beam headlight bulb. 529 Orange Right Headlight Bulb Out Check right front low beam bulb Replace the right low beam headlight bulb. 530 Orange Left Headlight Bulb Out Check left front low beam bulb Replace the left low beam headlight bulb. 605 Standard range SOC floor reached. Stop & Charge. 883 Before starting, exit Tow mode The car is still in tow mode, so it cannot be started. 888 red Disarm vehicle with key fob before starting VMS/PEM key mismatch Press the button on the keyfob. 889 Service Required. Charing restricted to storage level. 924 DMC HW: ESS Cable Interlock fault The dealer believes this might be caused by slight corrosion on the terminals of the safety wire. 947 System Too Hot – Vehicle Shutting Down DMC FW: PhaseB OverTemp fault Preceded by error message 1152. Resolution: PEM fans replaced. Likely cause – 1152 indicative of contactor(s) sticking open, but not fatal. Moisture in the open contactors may have caused rusting, resulting in this error. 960 DMC FW: VBrickMax versus VBattery Error fault You don’t want to know. 963 DMC FW: Line Current Not Equal Request fault Check the 150A line fuse(s) in the PEM service window and replace as needed. 977 Car moved while charging – charge stopped. DMC FW: Moving during charge fault Got this for trying to change the wheels while charging the car! Spinning front right wheel by hand (after jacking up car) triggered the message. 981 DMC FW: Bad State Transition Fault Dog tripped over charging cable. Discuss. Charger seems to be having troubles. A reset from the chargepoint fixed it. 1087 DMC FW: Line Current or Voltage Offset Too Large warning PEM fuse(s) blown, needs to be replaced. Can show up incidentally without meaning any trouble. 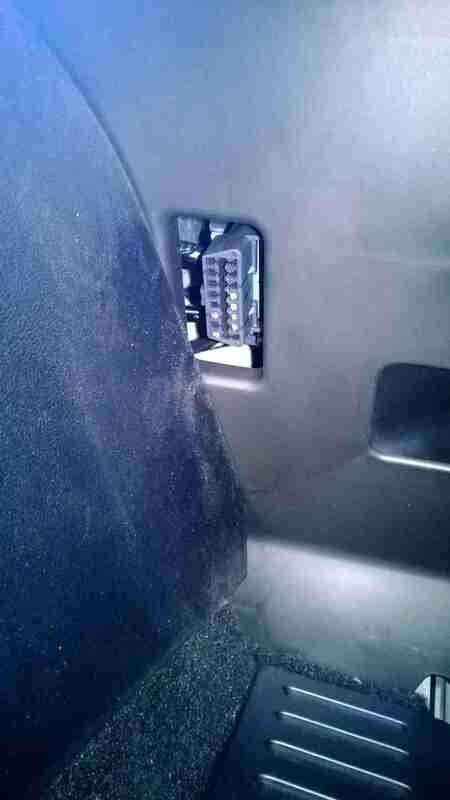 1092 Do not plug in charge cable while driving Key left in ignition while trying to plug in? 1095 Press brake pedal before shift. DMC FW: Press brake before shift. Press brake pedal and then select a gear. 1103 ABS & Traction Control Problems. Service Required. ? Pulling out ignition key and waiting until car shutdown (15 minutes) cleared it. Tesla couldn’t find issue. 1146 DMC Motor Fan Problem Low fan speed. Only appears in debug mode? Probably the PEM/Motor fan needs to be replaced. Also check the connectors or wiring between the fans and the PEM. Could just be a bad contact . 1152 Charge time increased due to high temperatures. DMC WARNING Charge Thermal Limit (bonnie) Caused car charging rate to intermittently drop from 70amp to as low as 19amp, did not correlate to outside temp or motor temp – PEM & fans cleaned, believed to be result of massive cloud of insulation on freeway that I drove thru – if you see error, check that out first PEM fans replaced after error 947 received. No further issues. 1160 Drivers door ajar Close the door. 1161 Passenger door ajar Close the door. 1162 Trunk ajar Close the trunk. 1174 Fasten Seatbelt Fasten your seatbelt. 1493 yellow ESS: Extremely Low. Begin Charging ASAP. 1554 orange VMS: Not receiving VDS version number Car can drive but a full RESET is needed: In the front hood pull battery fuse and in the trunk pull the orange ESS Main switch. Then wait 3 minutes. 1900 orange Communication Problem: Service Required VMS-VDS comms fault Happened twice while trying to download logs to USB stick. Went away on third attempt but logs were rejected by Tesla Motors Upload. The USB stick does not seem to be faulty. 2005 yellow No response to request to stop charging Car can drive but a full RESET is needed: In the front hood pull battery fuse and in the trunk pull the orange ESS Main switch. Then wait 3 minutes. 2017 yellow No response to request to change charge mode Car can drive but a full RESET is needed: In the front hood pull battery fuse and in the trunk pull the orange ESS Main switch. Then wait 3 minutes. 2031 yellow No response to request to save charging time Car can drive but a full RESET is needed: In the front hood pull battery fuse and in the trunk pull the orange ESS Main switch. Then wait 3 minutes. 2033 yellow No response to request to save charge timing Car can drive but a full RESET is needed: In the front hood pull battery fuse and in the trunk pull the orange ESS Main switch. Then wait 3 minutes. 2037 yellow No response to request to save cost/kWh Car can drive but a full RESET is needed: In the front hood pull battery fuse and in the trunk pull the orange ESS Main switch. Then wait 3 minutes. 2070 yellow No response to request to get keyfob function Car can drive but a full RESET is needed: In the front hood pull battery fuse and in the trunk pull the orange ESS Main switch. Then wait 3 minutes. 2078 yellow There was a problem processing your request No response to request to enter Tow Mode Car can drive but a full RESET is needed: In the front hood pull battery fuse and in the trunk pull the orange ESS Main switch. Then wait 3 minutes. 2096 yellow No response to Pin submission Car can drive but a full RESET is needed: In the front hood pull battery fuse and in the trunk pull the orange ESS Main switch. Then wait 3 minutes. 3001 SHFT: APS Voltage ?